What did the month of November teach you? Life offers us so many lessons, opportunities, challenges – always a learning process, a refining, a growth edge. How are you living a reflective life? 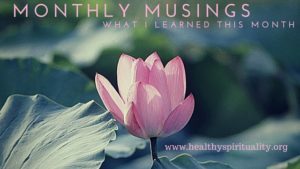 Each month I look back at what I am discovering, learning, and exploring in life – I call these my monthly musings. Capturing these special moments gives meaning, depth, and delight to life. Let’s wake up to the wonders in the ordinary all around us. I record what I notice on the pages of my Monthly Musing Journal. You can use anything, scraps of papers, a journal, or a calendar. Copies of my Monthly Musing Journal are available on Amazon and are a convenient way to keep track of the little things in life we often miss. Or if you want to click the button at the end of this post to get a FREE copy of my one-sheet Monthly Musing handout. Three big lessons for me this month plus a celebration. The first one is a no-brainer. Yes, Ireland is lovely and what a great experience to check this one off my bucket list. It’s on your bucket list, I hope. I find myself thinking back on this pilgrimage and smiling with a sense of great joy. The second one is a hard lesson to name and share. Looking back onto 2018, I made a major time-consuming decision based more on my feeling of not being good enough (ironic and interesting to note that “enough” is my word of the year) and out of a sense of inadequacy. Not the best discernment. The good news I hope to remember to ask myself before moving forward at crossroads in my life. What is my motivation for doing this? Will it bring me closer to God or draw me away? What is driving me to say yes to this step? And the third related lesson is that I can pivot and change. Life is too short to keep doing something over and over again that is not in your best interest, health-wise, spiritually-wise or relationship-wise. I used to take pride in finishing everything I started – no longer. Nope. Nada. Over that. I choose life over dread. Breathing freely over suffocating burdens of to-dos. I am celebrating the release of my latest book – Christmas Crossroads – 30 Devotionals for the Holiday Season. Fun to realize that one of the themes of this book is discernment after I just experienced an epic fail in this practice. I guess life is a lifelong journey full of many lessons – if we pay attention and allow God to continue to form us. Insightful and inspirational blog post by Laura Boggess on silence, prayer, and quiet listening. And did you realize we have 100 10 minutes blocks of time each day? A new way of looking at time use and management. The Oxford Word of the Year 2018 is… toxic. Ouch! Their research shows that along with a 45% rise in the number of times it has been looked up in their dictionaries over the last year the word toxic has been used in an array of contexts, both in its literal and more metaphorical senses. Merriam-Webster created a page that you can enter a year and see what words were first used in print. Fun to put in your birth year or another year of your choosing. Here are a few words from the year I was born: action figure, antsy, tank top and jock itch. I have mentioned packing cubes before but several of us used this once again on our trip to Ireland and talked about how much we liked them. Would be a great Christmas gift for the traveler in your family: If you want a copy of my cheat sheet I have made it into a free downloadable printable and you can just the button to get the free printable. I compiled these sheets plus additional information in a book, a two-year journal that is available on Amazon. I don’t want to lose the loose sheets of paper and think having it in a book form will make it more of a keepsake. Keep all YOUR musings in one place. What did you learn in November? Please share – I would love to hear about your journey and all your life lessons.